MobileMars is expanding its line of USB Car Chargers once again. The line already includes car chargers designed for the U.S. Army and Susan G. Komen. The recent addition to the line of USB car chargers are the NCAA Collegiate USB Chargers, dedicated to providing mobile car chargers to users out there who strongly support one of the over 160 schools officially licensed to have a design. The USB car chargers available from Mobile Mars are by far the one of the most ambitious projects taken up by US Digital Media. 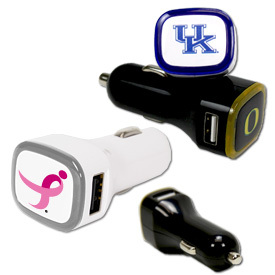 Each of the over 160 licensed schools possesses a unique design for a car charger that has been determined by the college logo and other designs. The mobile chargers are APU chargers (APU standing for Auxiliary Power Unit) provided by QuikVolt. The chargers’ components are housed by high impact ABS plastic for durability and resistance to damage from daily wear and tear. Components are made in the USA to ensure some standard of quality. And the unit meets all CE, FCC, and ROHS specifications needed for proper certification. The NCAA Collegiate USB car chargers can take a maximum load current of 2100mA. This capacity specifically enables the car charger to possess two USB charging ports. One port is dedicated to standard USB devices requiring only 1 amp, and the other, for devices that demand higher current charges at 2.1 amps. Because of this, the Collegiate car chargers employ a color-coding scheme for USB devices. The white port covers iPhones and other smartphones that charge at 1 amp, and the black port takes care of the more demanding mobile devices, such as iPads and tablets. Though the most important features in USB car chargers are often the maximum load current and the number of ports provided, there are a couple of features on the Collegiate USB chargers that are worth mentioning. For one, the chargers have LED rings integrated into the design to let users know that the device is plugged in and charging connected devices. Secondly, there’s a thermal shutdown function that ensures your devices or the unit itself won’t melt when electrical conditions take a turn for the worst. And third, the USB car chargers have overload protection, which keeps any mobile devices plugged into the charger from taking in more current that it should for its battery capacity. This entry was posted in Articles and tagged car charger, collegiate, mobilemars, NCAA, quikvolt, usb car charger. Bookmark the permalink.